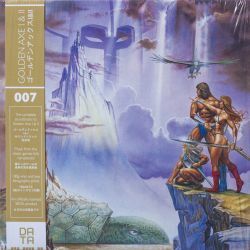 This release features the unforgettable artwork from both games, supplied on two thick lithographic prints, with the record itself pressed on heavyweight translucent gold or classic black vinyl. An additional limited edition, featuring a purple swatch effect, is also available for early buyers. The outer sleeve features rare artwork from the 1989 Japanese edition, sourced from the SEGA archives and presented on 425gsm cardstock with gold flood printing. As always, the audio has been carefully restored and mastered using the original console as the source, ensuring these memorable soundtracks are preserved for many quests to come! USgamer: "Golden Axe I & II Soundtrack Review: All That is Golden Does Not Glitter"